What can I say? Easy to make and impossible to tear off! Firstly, wash the apples and remove the stems. Then put in craft sticks into the top, and butter a baking sheet. Put caramels and milk into a bowl and place into a microwave for 2 minutes, stirring once. 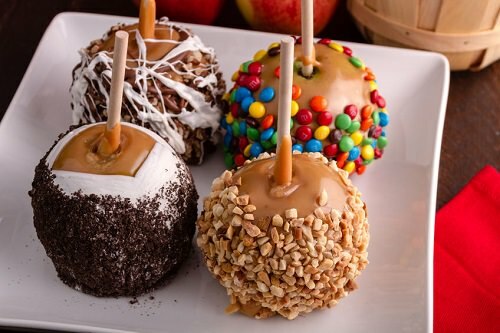 Cool it a little and dip each apple in the caramel. Put them on the prepared sheet and bake till ready.